Warnings and additional info: Suggested Age Guideline: 8+. Please note there is no babes in arms policy for this show, and children under the age of 2 will not be admitted into the performance. 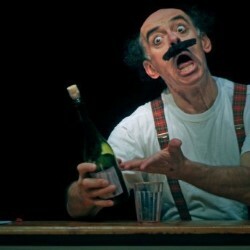 A sparkling comedy classic: Paolo Nani, alone on stage with props that can be held in a suitcase, performs 15 acts, all of them based on the same theme but played in 15 highly humorous versions, without a single word being said. This is probably the Danish theatre production that has toured the most throughout the world (so far over 1500 times in over 40 countries). A sparkling study in style, creativity and timing, having been on tour since 1992, The Letter continues to amaze and amuse audiences of all ages.